Welcome to the resource center for the I/O Explorer USB! 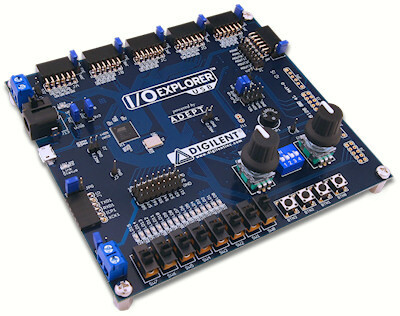 Please Note: The I/O Explorer USB is a legacy product and is no longer supported by Xilinx's newer tool sets. As a result we will no longer be producing the board, and once current stock is depleted there will be no more. If you need help finding a replacement product, please view our comparison tables or email sales@digilentinc.com. Technical description of the I/O Explorer USB and all of its features. The Wiki may contain more up-to-date information than the PDF.